Convenient tote bag with large branding area. Made from 130gsm recycled PET which is manufactured from used water bottles. 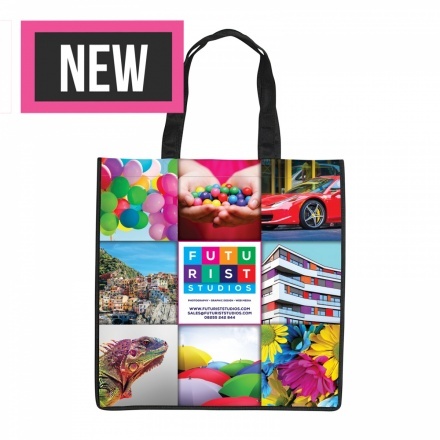 This bag is black with a white printable panel and can be printed in full colour as standard. Ideal for giveaways at trade shows or any promotional use. Our custom printed Image Tote Bag will make your brand stand out from the crowd. Example price for a product with full colour transfer print. Delivery: Our standard lead-time is 3 working days from order and it's free.